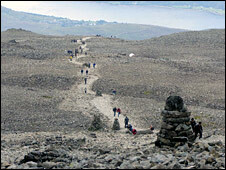 The cairns were cleared because they were deemed to be unsightly. Volunteers have completed a five year long project to clear more than 120 cairns from the summit of Britain's highest mountain. Ben Nevis' owners, the John Muir Trust, said the structures were unsightly. About 20 have been left along the main path close to the top. The trust said the operation was done to preserve a feeling of remoteness and wilderness. Remains of a wheelchair and a piano were found during the clean up.